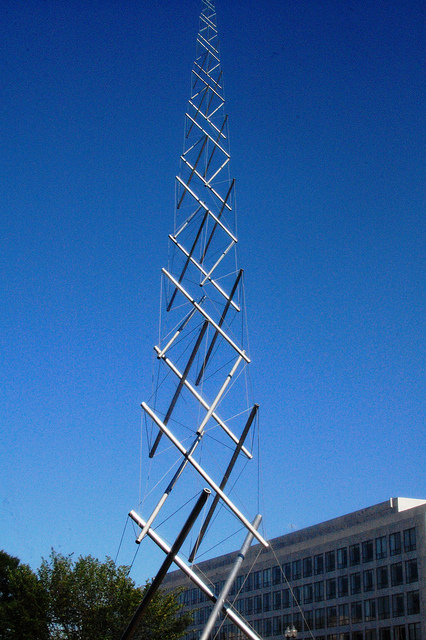 Read here about the Needle Tower, one of Kenneth Snelson's most well known works, partially due to its location on the Washington DC Mall. The Needle Tower, 1968,is composed of aluminum cylinders & stainless steel cable. It measures 60 x 20 x 20 feet, 18.2 x 6 x 6m. It belongs to the collection of the Hirshhorn Museum & Sculpture Garden, Washington, D.C. and stands outdoors on the Washington Mall. Needle Tower by Snelson photo by BAR photography"
In this video, 15 members of the museum staff up-right the tower following some conservation work, in Hirshhorn Plaza. This video animation shows a Needle Tower-like construction. The animation differs in that it is 50% taller (90 feet) and the top cylinders do not taper in size. The Needle Tower is documented as being the inspiration for researchers to seek in tensegrity structure an explanation for biological mechanical structure and information propagation. See Levin. This page was last edited on 27 January 2019, at 12:42.